This entry was posted on Tuesday, January 29th, 2019 at 12:45 pm. WESTBURY’S Person of the Year 2018 award has been won by Jim Shaw, who has served the town as an on-call firefighter for the last 30 years. Hundreds of votes were received in the competition which was organised by White Horse News to find the person who has made a real contribution to the community in 2018. Jim started his career at the age of 18, joining the fire service in 1988. He now serves the brigade as the watch manager and works hard to encourage people to join the fire service. He was nominated for his dedication to the service, giving over 120 hours a week. Jim said. “I feel quite humbled to be honest! It’s nice to know that people appreciate the work I have done over the last 30 years. But really I couldn’t have done it without my wife and children. “I was already in the fire service when I met my wife, we have been married for 25 years this year, but she has had to deal with a lot, cancelled plans, staying close to home, so it’s really thanks to them. Ian Drew, editor of White Horse News, presented the winner’s shield to Jim last week. Ian said, “Congratulations to Jim on winning our Person of the Year competition for 2018. 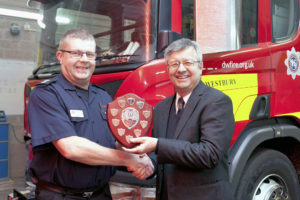 Jim has given his time and dedication to the Westbury Fire Service, with the town showing their appreciation for his hard work and commitment over the last 30 years. He has gone beyond the call of duty to help ensure that the town remains safe in an emergency. Other nominees were Nick Jones, Sharon Jones, James Lewis, Bill Prior and Lynne Vercoe.